We know how to complete our renovations on time and on budget. Give us a chance to show you the Remodel Right difference. Kids Bathroom, Guest Bathroom or Master Bathroom? Every bath remodel is unique. We start with a clean slate and cater to your tastes and style. There are a broad range of styles in the area from ranch, historic and beach homes. We can handle it all. Our architects and designers are experts in their fields. We tie it all togehter and give you a single point of contact. 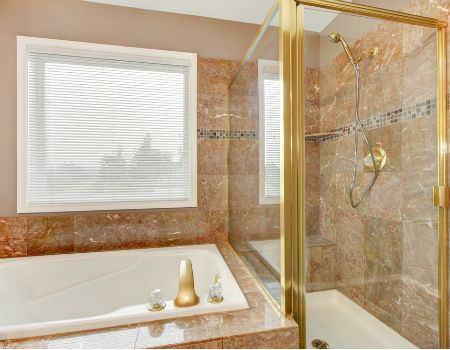 Whether planning a bathroom addition or remodeling existing bathrooms, there is a list of goals you wish to accomplish. Having a beautiful bathroom upgrade is a remarkable achievement; an efficient bath design can eliminate traffic jams, proper lighting can enhance your morning routine and sufficient storage assists in keeping the space tidy. We can help you to come up with solutions that will take care of all your bathroom needs. The process of remodeling a bathroom with the design-build approach is becoming increasingly popular. This is largely due to the many benefits that can be gained by using this approach. Design-build contracts are a brilliant technique used widely across the globe. As implied by the name, this kind of contract is utilized when design and construction simultaneously take place for the duration of the contract. Design-build contracts are typically the preferred contracting technique when a project has a tight schedule as it is designed to save time, re-work and money. Using this approach also establishes the budget, materials, and layout before starting the project. The design-build approach provides the option of having a single source of accountability for the duration of the project. It lends itself to cooperation, relationships and fosters teamwork. The relationship developed during the design stage assists in ensuring the foundation is laid for a successful construction project. With this approach, precise design and construction particulars are being developed all through the process and owner “value” remains the main focus. A major benefit of simultaneously working with a design expert and construction professional is that potential problems are discovered and communicated before the start of the project. Having discussions about the budget during the design phase will assist in keeping the project within a realistic budget. Discussing the price implications of design choices will ensure the homeowner plays an integral role in deciding the final project cost. Upon finalizing the scope of work, the clearly-defined costs will be controlled by us. The design-build approach assists in removing uncertainty that could arise in construction and material specifications. Since the engineer, designer, and builder are part of the same team, protecting the client’s interest remains the focus. It may seem that the design phase takes a bit longer but overall the design-build projects can be finished in a shorter time because the process eliminates error, miscommunication, and mistakes. This means possible construction problems will be uncovered early and greater communication allows everything to keep moving forward. The design-build approach is inherently flexible during the design phase; therefore, it is a remarkable way of tackling various types of projects. Forming a team steeped in design and construction experience will create the opportunity for “one-stop shopping” at its very best. Please contact us for further details on how we can help you with your bathroom renovation project. You Have Questions? And We Have Answers! How do we keep the bath remodel on budget? What are some of the key bathroom remodel mistakes to avoid? Even if you r home is 100 or 50 years old, the bathroom can be modern and new. 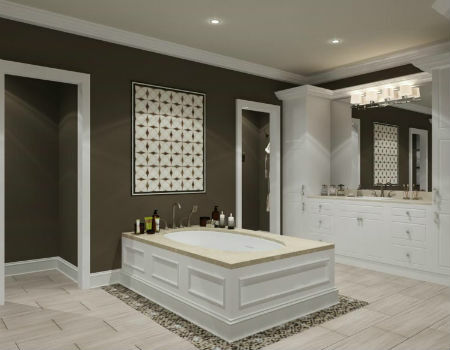 Add a spa tub or glass shower doors and double sinks. Upgrade to the latest bathroom fixtures. 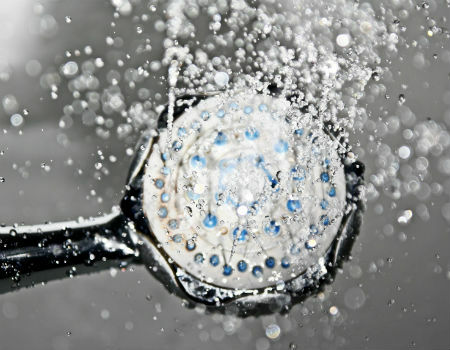 Change out old showerheads for rainhead show heads. Or add a doilb eshower so no one gets the “cold shoulder”. Sleek designs calls for glass and chrome. 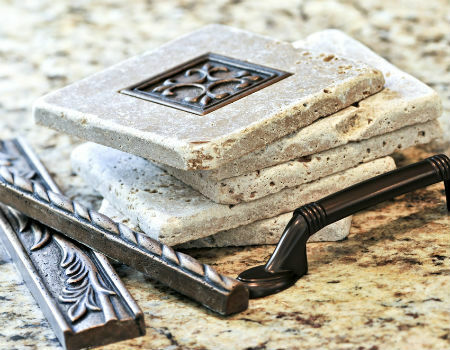 Rustic designs may call for stone, marble and extravagant listellos. We have the perfect design for you. Finish off the new bathroom with beautiful borders, fixtures and hardware.